Of course she did not. As I am twenty-some years beyond my intro to Sociology course, I confused Auguste Comte, founder of sociology and positivism, with Cesare Lombroso, founder of anthropological criminology, whose doctrines implied that criminality is inherited and that you can tell a criminal by the way he looks. Hence, “That’s what Comte said,” makes no sense, but “That’s what Lombroso said,” now that’s quality sociologist humor. Because she said “Obviously, I am a good cook,” as though one could tell by the spacing of her eyes or the curve of her cheeks that she was a good cook. She does not do pastries very often. As though cracking jokes about Italian criminologists and French sociologists weren’t enough, I have to go bringing the works of Voltaire into it. Truly, I have a dizzying sense of humor. 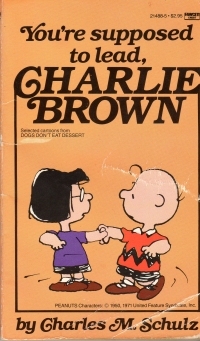 This book is not only a collection of Peanuts cartoons, but it’s a subset of a larger collection entitled Dogs Don’t Eat Dessert (1987). It’s the story of Charlie Brown and his dog and his friends. Things you’ve seen and read before, especially if you’re old enough to have had fresh Peanuts when you were young. Which, strangely enough, means you’re older than high school. But Schulz was pretty good at timelessness, I think, which is why, according to Forbes, his estate ranks highly amongst earnings from people who have passed away and why there’s still a major motion picture forthcoming. I have nothing more to say except that I’ll read more Peanuts in the future. I like them. If you’re interested in serious discussion about the themes within, see this book report from 2005: What’s It All About, Charlie Brown? by Jeffrey H. Lorria (1968). Accompanied by comments posted two years later to my old Blogspot blog by detractors of Jeffrey H. Loria. Yesterday, my beautiful wife participated in the running portion of the Turkey Trot and ran five kilometers, which are Canadian miles, and she did this without stopping, sobbing, or being chased. Walked fast a couple hundred meters. Ran a few hundred meters. Walked real slow a couple hundred meters. Repeated this cycle at intervals throughout. Swiveled my head 180 degrees Linda Blair style to keep in sight a sprinter and a dawdler. Carried 50 pounds for a kilometer because it was too tired to walk. Put down the 50 pounds when it saw the finish line and wanted to run across it. Helped up the 50 pounds who ran through the finish gate with its arms raised triumphantly and promptly tripped over the finish line–or at least the timing mat across the finish line. I ask you, gentle reader, who got the better workout? I bought these books, along with a couple aged literary magazines, at the Friends of the Springfield-Greene County Library book sale this autumn and I read them pretty quickly during football games and whatnot. After all, they’re short little chapbooks in the vernacular. In the olden days, back when I was doing poetry at open mic nights and fresh out of college steeped in the classics and, as you would expect, the snobbishness of loving the classics and lambasting modern poetry (not just poetry in the vernacular, but tenured modern poets as well), I was a bit unforgiving in my contempt of lesser poems. Now, I’m twenty (almost) years older than that. I’ve read more poetry, including continuing attempts to read the (as of the book’s publishing) Complete Works of Emily Dickinson. I realize that most of the poetry that is out there is not the best poetry out there, even from the classic artists. Some poems really capture something and speak to you, and some do not. And the sum of the some varies from person to person. Is that a disclaimer, leading to the pronouncement that these poems are not good? Well, sort of, but these poems are not bad. Amidst my readings of friends’ work (sorry, Doug) and after my editorship of a fledgling literary journal in the mid-Clinton era, I’ve read some bad poetry. These are not bad poetry. Patchwork of Poetry and Verse is the better of the two volumes. There are a lot of good moments in them. I’m not driven to own or memorize any of the poems, but I recognized and appreciated some of the sentiments within and turns of phrase spoke to me. 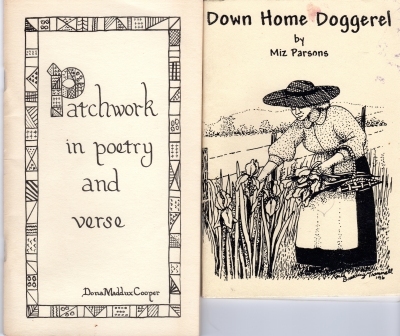 Down Home Doggerel is more observational and does not take itself seriously–note the title itself calls it doggerel. But it’s a woman of some years expressing herself and her world around her in verse. Good for her. I mean, twenty years from now, are you even going to be tempted to read a Twitter stream from 2013? I think not. But twenty- and thirty-year-old chapbooks? I’m all on that. They took not only the drive to put their thoughts to paper, but the drive to lay them out (in the days before Microsoft Publisher or with a crude version of Pagemaker), and the drive to spend one’s own money on publishing them. Take it from someone whose chapbooks are twenty years old these days. So I respect it, and I can enjoy it. This book reads like someone’s Twilight 2000 campaign. Back in 1992, when I was playing Twilight 2000, the idea of a conventional and nuclear war in Europe was at least not written out of possibility by actual events. Of course, they’re not now, but the timeline developed by Game Developers’ Workshop was proven to be inaccurate (fortunately), so thinking about the Warsaw Pact in 2013 requires a bigger suspension of belief now than then and perhaps a bit of historical perspective to remember what that was like. Similarly, military thrillers from the early 1990s. 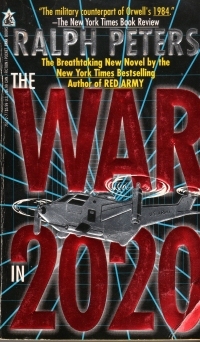 In this book, the United States has seen the Soviet Union fall and has cut its military budget after the end of the Cold War (this actually happened, public school kids). BUT the Japan of the 1980s continued rising, and although it was not a military power on its own, it provided very advanced weapons to the Arab Alliance (this has not happened). I guess analysts missed the whole Japanese economic stagnation thing that prevented it from being a real global power (see also Debt of Honor)–however, although it has not come to pass yet, the future remains TBD. After a worldwide pandemic, partial societal collapse in the United States, a bit of related reconquista, and some hemispheric excursions, a survivor of the first exposure to the Japanese super helicopters (who had to walk out of war-ravaged Africa, hence the early association in my mind with Twilight 2000) is the colonel in charge of a squadron of new super US weapons is staged in Russia (our erstwhile allies in this case) to stop an offensive by the Islamic Republics backed by the Japanese. They have a new weapon–The Scramblers–which disrupt human neural function, kind of a neutron bomb that leaves its victims alive and helpless. But the United States has an ace up its sleeve, too. So it’s alt history now, and if you can read it that way, you might get something out of it. Peters is not as good as Clancy–there are too many characters just put out there in detail and then cast off–but it’s not a bad read. It does offer a bit of optimism, though: Peters is a shrewd analyst, but he got these predictions wrong (and, in his defense, in an afterward he says he has played a lot of things up for narrative effect that were not realistic or probable). But the last 25 years have not gone this way. And whatever the shrewd and not-so-shrewd analysts in the papers and on the Internet say about our immediate future, that has yet to happen, too, and far better students of human nature have missed the mark. By that, I mean that Peters does grasp certain elemental truths about man and his relationship to other man–and power structures and tribalism that result. Unlike some who prognosticate and politic with misconceptions in mind. But the future will probably look different from all the things we see published as probable. This book is a strange mixture of English cottage mystery and American police procedural. Which sort of makes sense, given that it is a Canadian mystery novel. The plot revolves around a man found dead in the cabin of a retired Toronto detective. 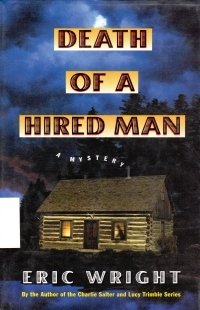 Is it someone who wanted the former hired man, a simple man who thought he was heir to his brother’s successful farm? Or was it someone looking for the detective for revenge? This particular plot is spread among a couple of subplots, including a convoluted story about the detective’s allegedly illegitimate son coming from England to meet his ‘father’–convoluting the story and warranting the quotation marks is the fact that the detective, as a young man in World War II, claimed to have impregnated the English girl to take the fall as the bad guy who returned to Canada and did not cause trouble for the actual father, a man of some repute in the town. So when the not-really grand daughter visited Canada and her grandfather for a couple weeks, he enjoyed having her around. Now, he’s got to wonder whether he should come clean with anyone, including his new wife. As a newlywed in his sixties, the detective and his wife have to deal with the disposition of their duplicate properties: His cabin in the woods that he has leased or lent to the former former hired man and her house in town. In addition, he has to deal with whether to tell her his convoluted story about his granddaughter. And he keeps his investigations into the death under wraps, lying to her as to his purpose for repeated visits to see his old friends on the force in Toronto. Do you think my descriptions of the subplots overshadow the plot? Then I’m giving you an accurate flavor of the book. The author has at least one other series under his belt, and this particular book, the second in its series, exaggerates the flaws of a series book–too much series business, not enough book business. Another flaw with the book, I think, might be a bit of city bias: that is, the detective comes up from the city to the back country, so I can too easily see the author doing the same. The up country characters are a bit simple (except for the cops, of course: those guys are multi-layered with their own backstories that also detract from the plot). The detective’s cabin sits on five acres along with a mobile home–and this is a lot of land. That’s city scale. Here in the country, five acres is a yard and a hundred acres is about enough room. So, hey, maybe this blend of chatty British tea mystery / character drama with police procedural (police are involved) is your bag. It’s not mine. I grabbed the book at the Friends of the Christian County book fair sale a while back to experiment with something new, so give me just a little credit for it. But I probably won’t go back for a second helping. So I heard “One of Us” on the radio, the 1995 hit from Joan Osborne, and I immediately had a mental image of a nose ring linked to an earring and hair that was spiked tall on top and long braids down. Does that look like Joan Osborne to you? Take a look. Then I remembered, no, you old fool, you’re thinking of Jane Child who looks like that. And to be honest, I don’t really like either of the songs. But I didn’t change the station when it came on. “Don’t Want To Fall In Love”, on the other hand, isn’t getting a lot of radio play 23 years later. “One of Us” isn’t, either, except for the silly “We’re playing our complete playlist in alphabetical order!” thing that one of the radio stations is currently running. In the dry, northern district of downtown Omaha, scores of technology entrepreneurs and creatives are hunched in front of their computers in what was once an abandoned furniture factory. They come to the Mastercraft building for space the size of nearly three football fields. Soon they’ll come for the blistering Internet speed, too. On May 6 Omaha became the latest rural American city to get an Internet speed of one gigabit per second, or 100 times faster than the U.S. average. So. A city is a large group of people together. A rural area is not many people far apart. What is a rural city? One of those small, backward cities on the interior of the continent, no doubt. Where they’re not really cities because they don’t have rail urban transportation of one sort or another or good sushi restaurants (in the writer’s estimation, even though the writer might never have been in a rural city looking for it). Strangely enough, one senses a rural city is not considered a real city, contrasting with the government estimation that small towns are urban areas. UPDATE: Thanks for the link, Ms. K.
So I’ve been sporting a Van Dykish bit of facial hair for the last year and a half or so because that’s what IT professionals do in Missouri. Also, that’s what a lot of other people do in the Ozarks. However. But trimming last week, I broke the guide on my little $10 grooming tool. It was a little trimmer with a plastic guide that snapped on and had a couple of settings for beard lengths. One of the little pegs that gripped the notches in the side of the trimmer snapped off as I was putting it back on after cleaning it, so it became useless except for cutting facial hair close enough to shave off. I’d just put new batteries in it, too. So I picked up a $14 unit at the department store. This one was a little snazzier, with a dial that controlled a clipper that does not come off. Also, it’s hard to see exactly where the guide is in relation to the clippers as they lie askew the device and the guide is, as I mentioned, affixed to the device. I set the thing to its second lowest setting–I’d used the lowest setting on my previous trimmer, and I took a pass, and…. Apparently, 2 is the hipster setting. It mowed the facial hair to the level of stubble. I can only imagine what the lowest setting is. 600 grit sandpaper, perhaps. Given that the trimmer had mostly eradicated my beard, I took the razor and finished it off. And suddenly, I’m startling myself every time I look in the mirror. I don’t know if I’ll go bare-faced for long, or if I’ll miss the facial hair and slowly grow it back and see if the new facial hair trimmer has any setting that allows me to have facial hair. But I do know one thing: I look younger, strangely. Probably because I didn’t grow facial hair until my late 30s and think I look like the pictures from my youth. But for a little while, my chin will be cold. Chesterfield residents caught feeding animals will serve up to three months in jail, according to an amended city ordinance passed at a city council meeting earlier this month. It’s true: I am a notorious deer-feeder. I have planted delicious young fruit trees around Nogglestead for their dining pleasure. Or so they think. Under the amended ordinance, it is now illegal to feed all wild mammals, including pigeons and Canada Geese. Does the writer need remedial science courses or simply remedial writing courses? In the modern era, I fear the worst. If you like it when James Lileks takes screenshots of locations in old movies and looks up what they look like now, this book is for you. Especially if you browse picture books during sports on television, as I do. It puts historical images from San Antonio’s past and puts the same location and/or building on the right page with a bit of history about them. Some of the sites you’ll recognize, and by some, I mean “The Alamo.” Some focus on Mexican sites (that is, locations from when San Antonio and Texas were part of Mexico), some on American sites from more recent times. They’ve got a picture of a building being moved back when the city widened one of its thoroughfares. The building, unlike its neighboring buildings, are intact. So very cool. The images of San Antonio’s River Walk make me want to see it in person; unlike, say, Milwaukee’s River Walk, where they’ve thrown some concrete walkways beside the water and back doors on the restaurants, San Antonio’s River Walk looks to incorporate mature trees and other vegetation overhanging the water along with multi-level walkways and stairs. It looks cool. So the book did what it is supposed to do: It made me want to visit San Antonio. One thing about it, though: as a civic boosterism book, it features a number of then-and-nows of historic buildings turned into underpopulated (I assume) arts venues through the magic of tax credits and the like. Personally, I think this is a bad use of space, as it drains the public coffers for the good of a few people who like to go to the theatre once in a while and to be seen in the society pages of the newspaper at a fundraiser for the arts organization. But the book is not political, and it does show a number of commercial structures as well, so I’m only reading into it my own pecadilloes. According to my research, I haven’t read a Family Circus book in four years. According to my initial calculations, I thought 2009 was three years ago; however, damn, that is, in fact, four years. Where are they going? Slowly from the ever-expanding to-read shelves to the read shelves. And more, sometimes, but we’ll get to that. This book was initially copyright in 1971, but this is a printing from 1984. In a third edition of sorts. 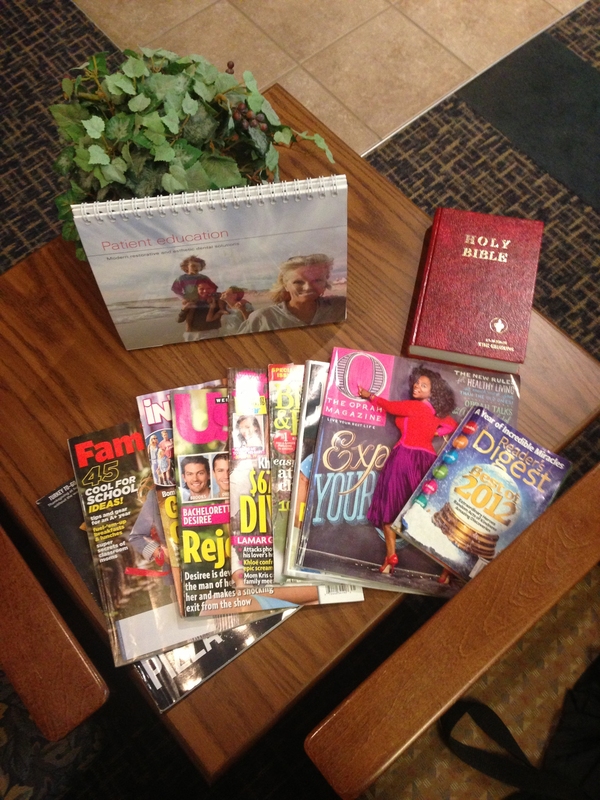 Ponder that for a while: these books were popular enough to go through several editions. Do you see that in modern cartoons not named Dilbert? I dunno, I don’t even read the funny pages of the local paper. 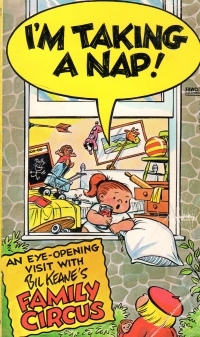 This is early in the Family Circus life: you can tell because the father starts out without glasses, and there’s a gag when he gets his glasses. In all of my living memory–which is appropriate, since this book came out before I was alive–he’s had glasses. I didn’t notice until the glasses panel that the father was without, which is a comment to how closely I study the panels before reading the punchline, I suppose. At any rate, amusing at best, but an exploration of domestic life with a family from the last bit of the middle of the last century. A worthwhile browse for me because it reminds me of my youth, when this stuff was fresh, and it filled time between plays in a series of sporting events, but I’m sure these things won’t get multiple reprintings in the future. Although I see some of the syndicates are putting out presumably print-on-demand editions such as this and this to have one more crack at the fan base. Good on ’em. So yesterday was All Hallow’s Eve, and there was an event featuring costumery of children, and we attended. The youngest dressed as Darth Vader, so Daddy’s all getting into the 21st century thing, and he (being I) determined that the Star Wars Imperial March was in order. So I pulled it up on my phone in YouTube. But that would not allow me to loop it, so I paid for an iTunes download and struggled with getting it to play and looping it (how did I get to be an old man who does not understand technology? It happened last night, apparently, and I don’t know how). And I placed it in my coat pocket so the Imperial March would be heard as he walked up to the cars at the trunk or treat thing and asked for goodies. In the excitement, the only person to notice was another little boy who we were following in the circuit. He was tall enough (that is, short enough) that his head was about the level of the trench coat pocket, and he kept glancing at it. Probably wondering why I wasn’t answering my phone. But it’s important that you, dear Internet, understand I am the unheralded Best Dad Ever. Or at least the best dad my kids have.